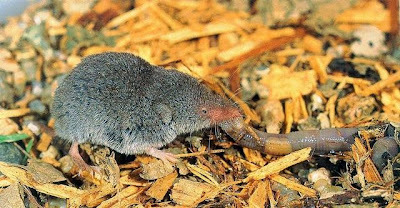 North American least shrew Cryptotis parva, from The Smithsonian Book of North American Mammals. Cryptotis, the small-eared shrews, is a genus of shrews found in southern North America and northern South America. They are mostly found in forests except for the North American least shrew C. parva, which prefers open grassy fields (Nowak 1999). Cryptotis parva is also the only species of the genus found north of Mexico, with its range occupying Mexico and much of the eastern United States. Characters (from Nowak 1999): Head and body length approximately 55-100 mm, tail length 12-42 mm, adult weight about 4-7 g. Upper parts brownish or blackish, underparts same colour or paler. Snout pointed, eyes minute, ears inconspicuous. 30 teeth, with four upper unicuspids: the second and third incisors, the canine, and a premolar; unicuspid premolar smaller than canine, usually minute. [C57] Cabrera, A. 1957. Catalogo de los mamiferos de America del Sur. I (Metatheria—Unguiculata—Carnivora). Revista del Museo Argentino de Ciencias Naturales “Bernardino Rivadavia” e Instituto Nacional de Investigacion de Las Ciencias Naturales, Ciencias Zoológicas 4 (1): 1–307.